1. Blanch the cauliflower in boiling water for 5 minutes. Lift out and drain on kitchen paper. Add the rice to the water and cook gently for 20 minutes until tender. In a separate pan, lower the eggs into gently simmering water and cook for 7 minutes, drain. 2. Heat half the oil in a frying pan and fry the onions and leaves for 6-8 minutes. Remove and keep warm. Add the remaining oil and the cauliflower to the pan and cook for 5 minutes, stirring until starting to colour. Lightly drain the rice and add to the pan with the paste, cardamom and peas. Grate in the coconut and cook for 3-5 minutes. 3. Shell the eggs and roughly break them up in a bowl. 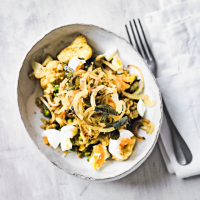 Spoon the kedgeree onto serving plates and top with the eggs, onions and curry leaves to serve. Cook’s tip The creamed coconut isn’t essential to this dish but it does enrich the rice and complements the spices. It’s sold in block form and can be found alongside the coconut milk. 2 of your 5 a day. A source of fibre.